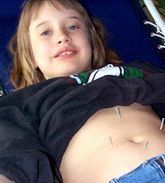 So you haven’t had accupuncture before and are somewhat apprehensive. What will happen? Will it hurt? January 25th 2006 – Copyright by Karen S. Vaughan, MSTOM, L.Ac. First of all, the visit will be a lot longer than for most doctors. I usually plan on an hour and a half for an initial visit and it will entail a lot of questions. Bring information on your insurance coverage, medical history, any drugs or nutritional supplements you are taking, and results of blood or other diagnostic tests which can be interpreted in terms of Chinese medicine diagnoses. If you have recent bloodwork you should bring it, as it is interpreted differently in Chinese medicine than with your MD. You should have a list of all medications, herbs and supplements that you regularly take, and a food diary would be useful for most internal conditions. Reports on radiology are useful for orthopedic or cancerous conditions. If your Kidney yang is deficient it doesn’t mean that your kidneys are failing, it refers to functions associated with the meridian that includes the kidneys and adrenal glands. Typically we capitalize the meridian names so they will not be confused with the western organs, but in speech it can be confusing. Feel free to ask if you do not understand. You may be given herbs, exercises or stimulation to do as “homework.” This will hasten your recovery or strengthen your system. Chinese exercises may seem subtle and you may wonder how they can be important compared to, say weight lifting or aerobics. However they engage the body, the breath and the brain in a way that is very profound.